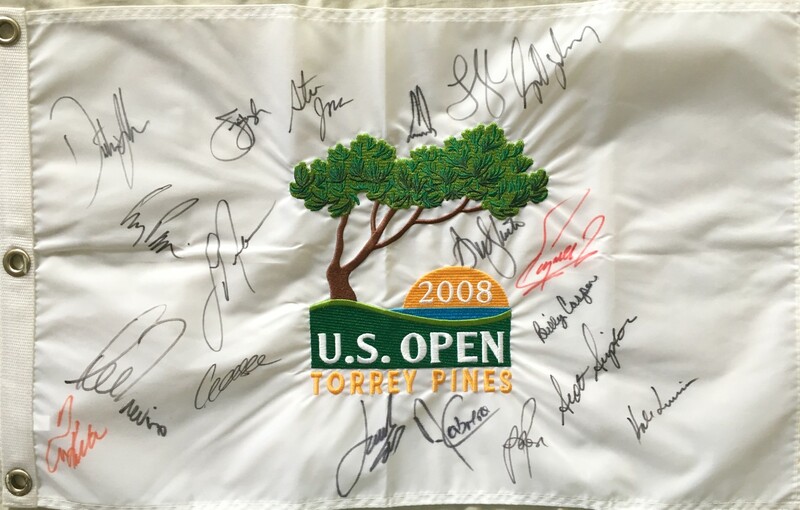 2008 U.S. Open (Torrey Pines) white embroidered golf pin flag autographed by 19 champions: Billy Casper, Retief Goosen (shorthand Goose signature), Ernie Els, Jim Furyk, Andy North, Dustin Johnson, Justin Rose, Lucas Glover, Angel Cabrera, Hale Irwin, Steve Jones, Tom Kite, Larry Nelson, Corey Pavin, Scott Simpson, Geoff Ogilvy, Jordan Spieth, Lee Trevino and Fuzzy Zoeller. 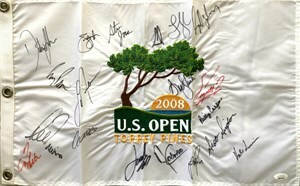 Obtained in person at Southern California PGA Tour and Champions Tour events. With certificate of authenticity from AutographsForSale.com. ONLY ONE AVAILABLE FOR SALE.